Adams, one of 273 Newman Fellows named across the country, is the student director of Wilson’s campus food pantry and volunteers with the college’s Student-Athlete Mentor (SAM) program, which provides peer-to-peer mentorship and guidance for first-year students to help them adjust to the demands of college. He has been active in volunteerism since childhood. Adams is majoring in exercise and sport science and is a Wilson College Curran Scholar. 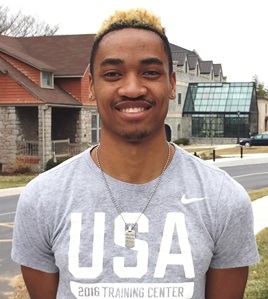 The son of Kim and Juanita Adams of Gaithersburg, Md., he is forward on the college’s men’s basketball team and was selected as one of the top 18 players in the North Eastern Athletic Conference for 2016-17. Campus Compact is a Boston-based, nonprofit coalition of more than 1,000 colleges and universities committed to “the public purposes of higher education.” Reserved for Campus Compact member institutions, the Newman Civic Fellowship honors the late Frank Newman, one of Campus Compact’s founders and a tireless advocate for civic engagement in higher education. The fellowship is a one-year experience emphasizing personal, professional and civic growth. Through the fellowship, Campus Compact provides a variety of learning and networking opportunities, including a national conference of Newman Civic Fellows in partnership with the Edward M. Kennedy Institute for the U.S. Senate. The fellowship, which is supported by the KPMG Foundation and Newman’s Own Foundation, also provides fellows with access to exclusive scholarship and post-graduate opportunities. For more information about Campus Compact, visit www.compact.org.